Interested in a real Mexican city with a low cost of living, lots of colonial architecture, a thriving arts scene, temperate weather, and an established expat community? Then living in Guanajuato, Mexico, a colorful, picturesque college town just might be that place. No gym membership necessary as Guanajuato, the capital city of Guanajuato province, is an old silver mining town built into a narrow valley sitting at an elevation of 6500 ft. Outside the main streets in the commercial center of town, most housing exists on narrow lanes and alleyways that rise, often including many steps, on all sides of the city. 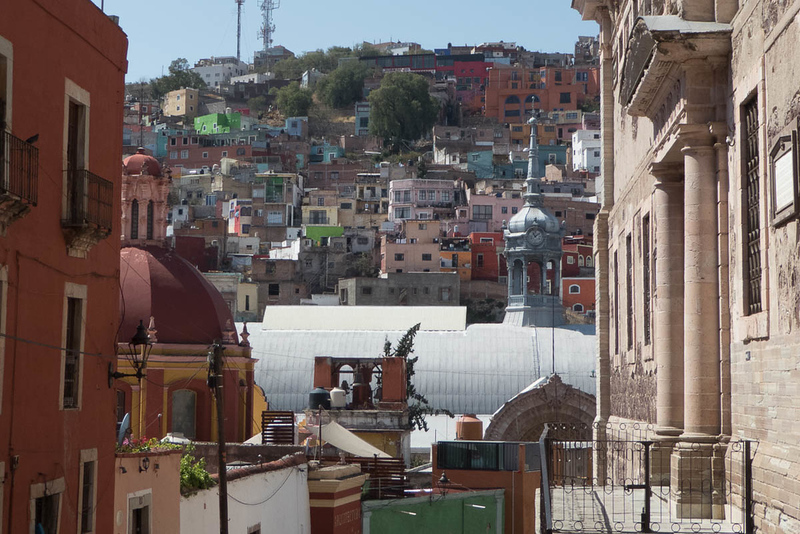 Guanajuato is a real town, with local people of all ages, plus some tourists and expats, out and about at all hours of the day and probably night (although since we aren’t night owls we’ll leave that exploration as an exercise for the reader). People are generally friendly and helpful once you approach them, but it definitely helps to have at least a little Spanish. 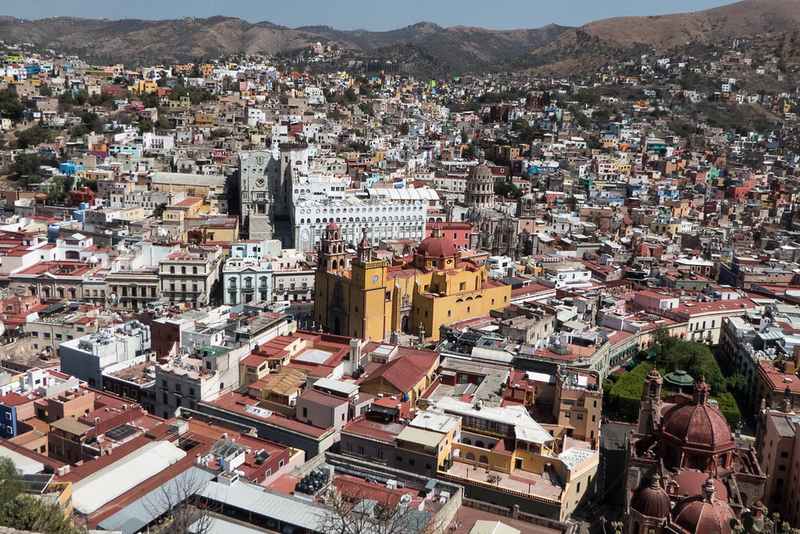 Given Guanajuato’s elevation and location below the Tropic of Cancer, its climate is temperate all year round. The coldest months are December and January, and the rainy season runs from June through September. Most days are bright sunshine under a clear blue sky. 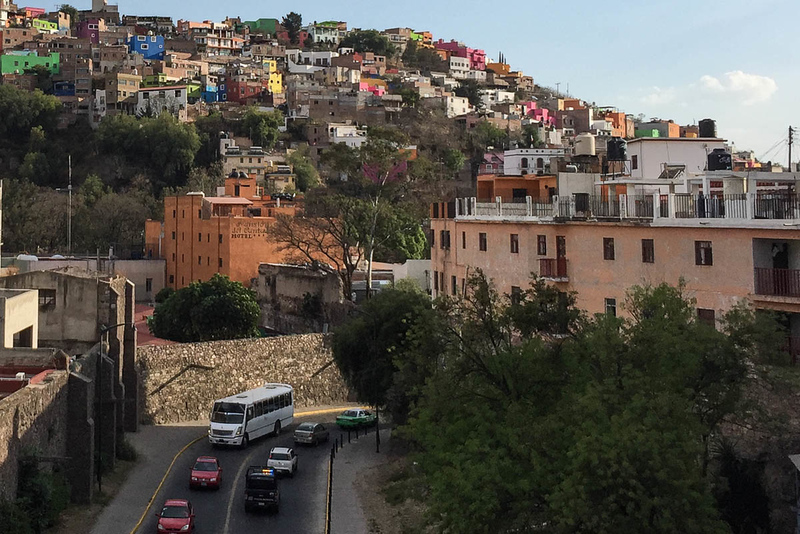 We checked out living in Mexico in March 2018, based ourselves in Guanajuato, and found it to be a great possible expat destination. Long term furnished rentals in Guanajuato, Mexico can be found starting at $500 US per month. We met a couple who rented a 2-bedroom top floor of a house for under $300 per month in, in their words, a rustic neighborhood. Our charming, fully furnished and well equipped one-bedroom apartment rents for $497 per month during the low season (April 1st – September 30th), up to $597 per month (during the Cervantes Festival in October), and $547 the rest of the year. Weekly rates are available for a minimum stay of two weeks. A big plus in our apartment was built-in filtered drinking water. We booked our apartment through Guanajuato Vacation Rentals. Note: We are not affiliated with them in any way. Utilities and WiFi were included in our apartment rental. However, utilities, including electricity, heating, cooling, water and garbage for an average 2-bedroom apartment generally run about $36 per month. 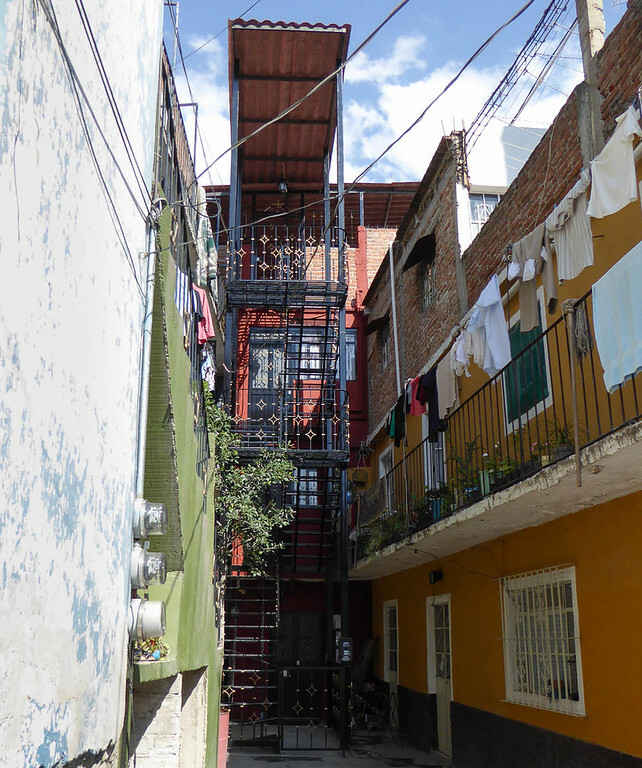 But given Guanajuato’s temperate climate, most apartments do not have heating or air conditioning. A monthly Internet package is about $23. Parking in the historical core is not widely available, so if renting in this area of town with a car, make sure to check on the parking situation. The neighborhood of Marfil is about 5-6 km from the commercial center of Guanajuato and close to the long-distance bus station. It is an area of old haciendas, typical smaller Mexican houses, and some new development, including gated communities. Prices to rent and buy tend to be higher in this neighborhood. Many expats choose to live in this area, especially if they own a car. By nature of the landscape, the major means of transportation in Guanajuato is walking. From our apartment to the center of town took about 20 minutes, perhaps a bit longer on the uphill return trip. Local buses are about 27 cents a ride, a bit more to the edges of town. Taxis are inexpensive, about $2.50 from the center of town back to our apartment. The taxi from the bus station to our apartment, which was about a 15-minute ride, cost a little over $4. A unique aspect of the city are the traffic-diverting tunnels running under the historical center. We generally eat out one meal a day, usually lunch, several times per week. Lunch in local restaurants with wine or beer costs between $10-15 for both of us. A lot of restaurants have a special of the day on a chalkboard outside for lunch which can be a real bargain. We usually chose restaurants in or close to Plaza de San Francisco, since it is more popular with locals, has better prices and a pleasant setting. At least three different places offer take-out chicken, cost of about $3.50 for a whole chicken, usually with potatoes, tortillas, and salsa. One of our favorites was a local chain called Pollo Feliz. Take out carnitas (wonderful slow cooked pork) are also available by the kilo at a couple of places; for $5 we had enough for two meals. We usually go to the grocery store (several from which to choose) twice a week to pick up staples and spend about $25 each visit. We are not trying to be especially frugal; however, if we have a choice between a Mexican or international product, we usually go with the Mexican one to save money, plus “when in Rome…”. We would also pop in, as needed, to one on the many small produce markets or the central Mercado, an experience in itself. As in all of Mexico, we recommend soaking fruits and veggies in silver iodine solution before eating. Several varieties are available inexpensively at grocery stores. Lots of bakeries beckon all over town. We rarely spent more than two dollars every time we went in for bread or rolls and pastries. A unique concept we haven’t seen anywhere else are stores with ginormous bags of various kinds of Cheetos. You can purchase a snack or the whole bag. Alcohol prices are similar to the US. We were able to find bottles of Mexican wine for about $5 a bottle. Mexican vodka is the least expensive liquor available for about $3.50 a bottle. Tequila prices are all over the map, depending upon the quality. Bottom line: A reasonable estimate for a couple for groceries and eating out would be $450 per month. Entertainment in Guanajuato, Mexico runs from inexpensive to free. 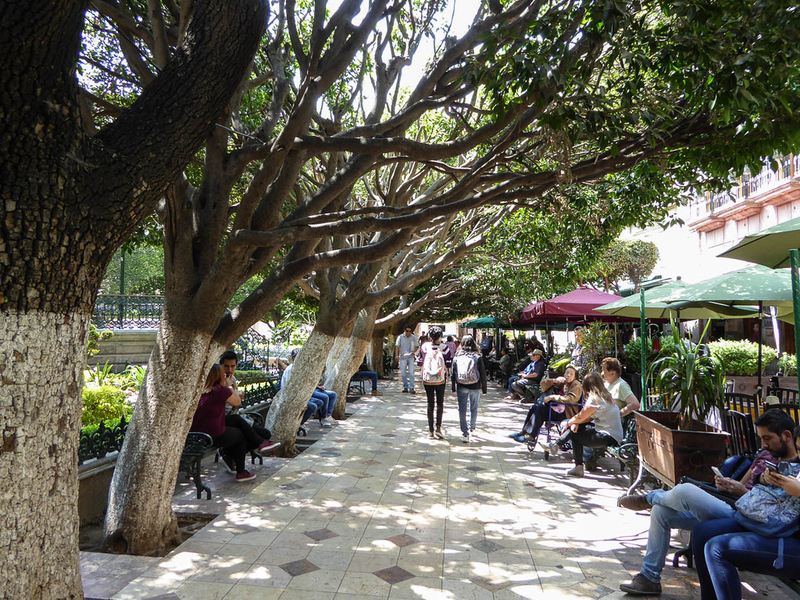 The city has many small squares or plazas, great for people watching. The larger Jardin de la Union, in the center of town, is alive at all hours, especially at night, often with free music. It is here in the evenings where you’ll find university students dressed as troubadours preparing to take people on an after dark alley tour of the city, a little over $5 per person. Day or night, go up to El Pipila Monument for outstanding views overlooking the city. Climb or take the funicular for $1.35 per person, cheaper coming down, but it’s a pleasant 15-minute walk down. 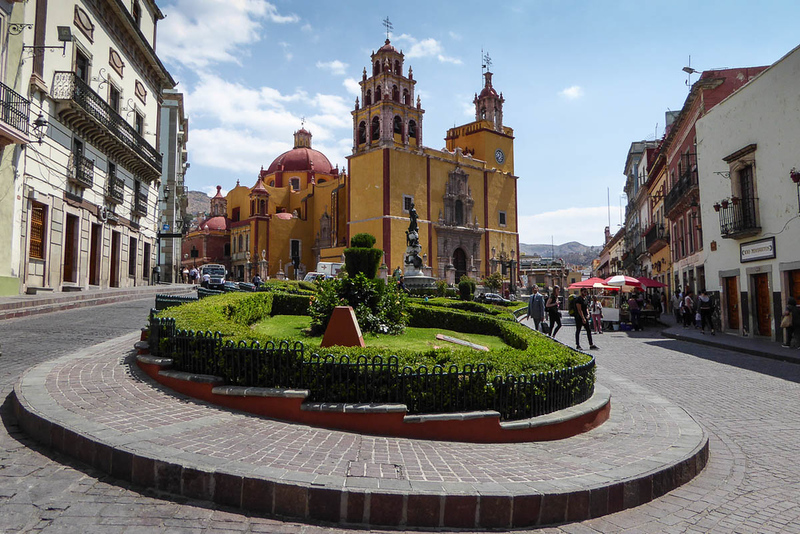 Visit the Basilica of Our Lady of Guanajuato or one of the other 20+ churches in town. 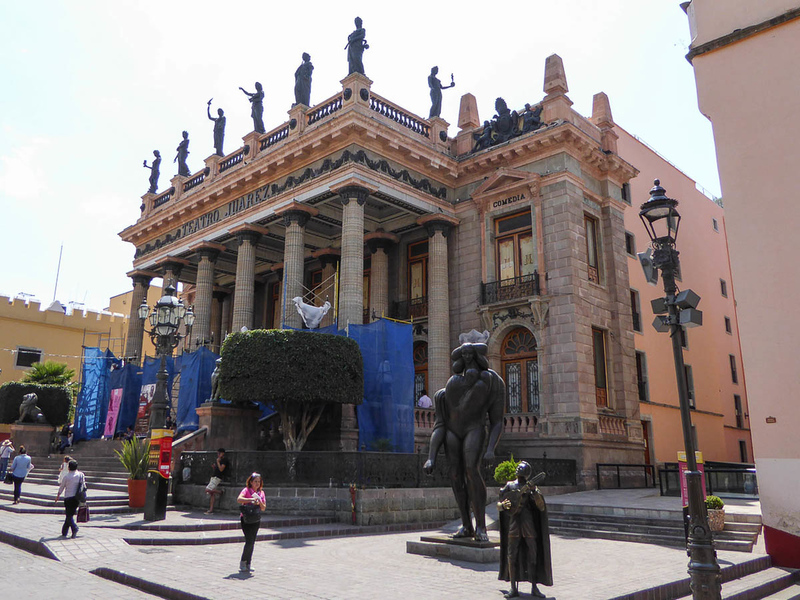 We enjoy live theatre, and Guanajuato has Teatro Principal and Teatro Juarez. During our time living in Guanajuato, we attended two performances at the striking Teatro Juarez, which reminded us of an ornate opera house. We enjoyed the University of Guanajuato Symphony Orchestra and a Mexican Ballet company. Both performances cost a little more than $5 per person. We purchased tickets a couple days ahead of time and arrived at the theater about a half hour before show time since there is no assigned seating. In so doing, we were able to sit within the first ten rows both times. Guanajuato also has an abundance of museums, ranging in admission price from about $1.35 to $3. Some of the more popular museums include Museo Casa Diego Rivera, Museo del Pueblo del Guanajuato, Museo de Momias (mummies), Alhóndiga de Granaditas, Guanjauto’s regional history museum, and Museo Iconografico del Quijote (Don Quixote Iconographic Museum). Guanajuato also hosts an annual Cervantes Festival in October. The closest airport to Guanajuato is in Leon about an hour away. Since it’s a smaller airport, ticket prices tend to be higher than to and from Guadalajara or Mexico City, especially last minute. Both these major airports are about 4-5 hours away by bus depending upon traffic. Mexico City has a better selection of prices and nonstop destinations. As there isn’t a direct bus from Guanajuato to the Mexico City airport, using this airport requires taking a long-distance bus from Guanajuato to Mexico City plus local transportation to the airport. Another option is to stop in Queretaro as we did – more on that later. From Guanajuato to San Miguel de Allende is about an hour and a half by motor coach. The cost is $7 per person each way. While we enjoyed picturesque, historic San Miguel as a day trip, we wouldn’t choose to live there. Something about San Miguel struck us as artificial. Too many high-end renovated buildings, hotels, and art studios. Too many tourists and too much English spoken for our tastes. The prices for food and drink are considerably higher than in Guanajuato. Given its popularity with expats, we view San Miguel de Allende as Mexico with training wheels, which might be perfect for some people, but not for us. We also spent a day in Queretaro, since it made a convenient stop between the airport in Mexico City and Guanajuato. There is a direct bus from Mexico City airport to Queretaro. What an unexpected surprise! 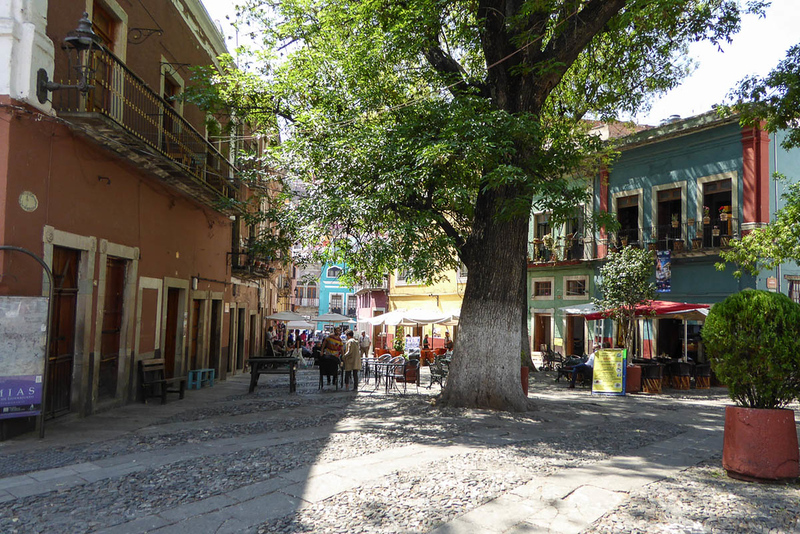 Queretaro is a city filled with colonial architecture a bit more off the tourist trail. We arrived after dark; the next morning when we stepped outside our hotel, we thought we were in Spain. The downside of Queretaro, compared to Guanajuato, is that the terrain isn’t as interesting. Also, outside the historical core, because of the city’s prominence of Korean electronics manufacturers, the traffic and sprawl can be quite bad. The bus from Guanajuato to Queretaro takes about two and a half hours and costs $13 per person each way. After visiting these three colonial cities in Mexico’s central highlands, our favorite is Guanajuato. We made the right decision to base ourselves there. It’s a stunning setting nestled in the hills, with a temperate year-round climate. It hits our sweet spot, enough tourists to have the infrastructure without losing its soul. If we choose to live in Mexico full time, our choice will be living in Guanajuato. Ian and Ann are a couple of crazy big kids who retired in June 2017, sold their house in San Diego, and hit the road in search of less expensive destinations, both in and out of the US. Their blog, Expatornot , recounts their exploratory adventures including practical details in the spirit of guiding and encouraging others who might benefit from their experiences. You can find their tips for long-term travel here. You can also follow them on Facebook. We really view our travels not so much as adventurous, more simply wanting to explore other cultures and destinations more long term before we’re too old to do so. We are currently in the US for the remainder of the year, except for three weeks in Mexico. Our thoughts on possibilities for 2019 are fluent and changing. Thank you for your continued support and encouragement. enjoy your posts. Looking forward to the next one. Thanks, Marge. Yes, we are back in the US for now. Be on the lookout shortly for three more posts on Spain: A Coruna, Santander, and Madrid including Spain Wrap-up. My wife and I spend February’s in Oaxaca. Many expats. Grittier that San Miguel and cheaper. Wonderful friendly people, both expats and Mexicans. Wonderful museums. Great music. Amazing Zocola. Superb restaurants. Walk everywhere. Poor local public transportation but $2.50 cabs anywhere within town. Thanks, Don, for the insight into Oaxaca, sounds like it’s our kind of place. It’s definitely on our list. Maybe we’ll meet you there one February.